My wife enjoys malty brown ales. Usually reserved for the fall and winter, we happen to live in a place that when the sun goes down, it routinely will drop into the 50’s to low 60’s, even in August. So, I decided to make a nice easy drinking, malty beer for us for when we are sitting around the fire out on the patio and enjoying the stars. I decided to take a different approach with this then the usual brown ales, which often have some pale chocolate and some crystal as part of the grist. I decided to make this a 50/50 beer of Best Malz Munich 1, and Briess 2 row brewers malt. I was sorely disappointed in North American Munich malts when I made my Octoberfest, just not malty enough, so I decided to try a German maltster instead. To get the color right, I added a touch of debittered Black malt. The next goal I have with this beer is to try out WLP 028. I very much enjoyed this yeast when I did my British Yeast experiment, and think it would make a great, clean house strain. I wanted to try it out in a malt forward beer first, as that is its primary purpose, but I am going to wash this, and use it in a split batch side by side with WLP 001 to compare hop expression the next brewday. Finally, I wanted to try Palisade hops. A newer strain, they are supposed to be more English in character, so I thought they would fit well in this beer. This beer is single hopped, so I can get a feel for what the hops will do. I mashed this on my HERM’s system that I just completed. It was nice to be able to step up to 168F for mash out. It was mashed at 154-155F for 60 minutes, then over 15 minutes, it was brought to 168F. I then did a fly sparge, collecting 8 gallons of 1.040 wort. This was boiled with the hop additions as above for 60 minutes. The aroma hops were added at flameout, I let it sit for 10 minutes, then I turned on the immersion wort chiller and the pump for whirlpool. After 15 minutes it went from 202 F to 90 degrees (gotta love the pump/whirlpool for rapid cooling). I then shut off the pump, let it settle for another 25 minutes while the chiller was still running, and collected the separated wort. O.G. 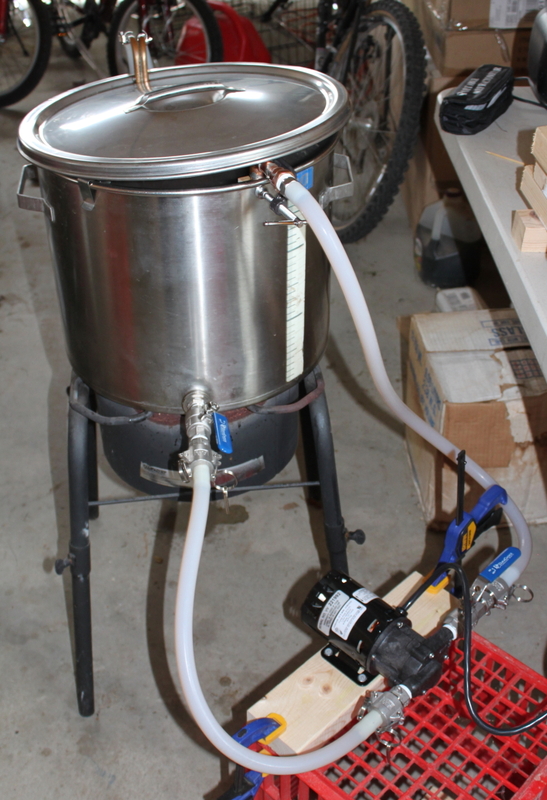 was 1.050, which is 75% on efficiency, pretty good, I think the recirculating during the mash helps quite a bit. For tasting notes, please look here.